As you may have heard, I’ve been a member of AIIM’s iECM committee for over a year. I’ve been more of a lurker as I was a little nonplused at the efforts of the committee, but I stayed with it to learn more about their efforts in detail and hoping to one day be able to help in a substantive way. Well, that day has arrived. We are taking on the creation of a prototype, CMIS-based, system to store the presentation from the 2009 AIIM Expo. The basic premise is to have one or more CMIS back-end systems storing content with a central interface that would provide content, seamlessly, to users. Rather than explain the details, I’m publishing the “official” write-up. Before you dive in, if you are a vendor with a CMIS implementation, we want to speak to you. You can contact me or the people listed below. Each AIIM Expo produces a significant number of documents (e.g. presentations, their related abstracts, the presenters’ biographies, vendor’s presentation material, etc.) as well as other content (e.g. videos of keynotes, announcements of future events, etc.) all of which could be better organized and made accessible to AIIM Expo attendees by applying content management technology to those information assets. The AIIM Interoperable Enterprise Content Management (iECM) committee has a proposal that would combine the resources of Content Management System (CMS) vendors, the ECM user community and the AIIM EXPO organizers to accomplish just that, apply state of the industry content management technology to better organize and make accessible the substantial collection of content produced by the 2009 AIIM Expo. The iECM committee is in the process of evaluating the new Content Management Interoperable Services protocol, which allows CMS integrators and other users to create federated and distributed ECM systems by combining the power of multiple CMS, even those of multiple vendors into a system of systems which makes all the content of those systems available to end users as though they were one system. 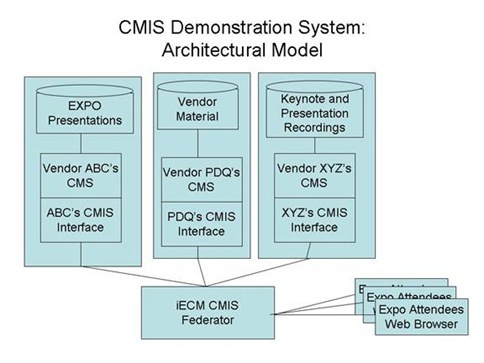 The members of the iECM committee and the corporations, government agencies, and other organizations that employ and sponsor those members are asking the vendors that are supporting the CMIS effort, and the organizers of the AIIM Expo to cooperate with us, combine our resources to demonstrate the power of ECM in general, and evaluate the usefulness of the proposed CMIS standard. · That the AIIM Expo 2009 organizers make available copies of the content discussed above, as it becomes available so that the iECM committee could make populate to AIIM Expo attendees using the same user name/password protections that are currently used for access to this information. The content would be divided into logical subsets, each to be hosted by one of the distributed CMS systems. The access to the entire collection will be via a CMIS based integration federator, with a web based thin client interface. If interested in participating in this CMIS demonstration system project, please contact the iECM Co-Chair, Thomas Pole at tpole@harris.com or Betsy Fanning, AIIM Standards Director bfanning@aiim.org. I would like to give a hand, but I’m no vendor. A little aggressive, yes, but in theory it is easy. This is just a search and retrieval and if existing apps are used, it should work. Also, we will need other help as well for the front-end, so volunteers are welcome. Sounds like a great opportunity. We would love to participate. I will follow up with your contacts. Well, I heard from EMC. Hey Billy, you guys interested? So the CMIS Federator in this case looks like it isn’t really a search broker, per se, but is more of a request broker or something that the front-end is talking to. You’re probably going to be building a web site that is going to make CMIS queries to pull in content from each of the repositories. One way to do that would be to have the front-end tier make CMIS calls directly to the appropriate source. Alternatively, you could have a “request broker”–nothing serious–just a class or something, that the front-end would talk to. It would make requests like, “Give me the presentations” and the broker would know that presentations reside in the XYZ repo. It would then make the CMIS call and return back the ATOM response to the caller. This approach is probably preferred if you think you might want to change out where you get a certain type of content. If that happened, the front-end wouldn’t have to change–only the type-to-repo mapping in the broker. Jeff, thanks for your input. The corpus of content has changed a bit. We are looking at putting similar content in each repository and then issuing searches, in parallel, to each repository and then merging the results. We are going to keep the security simple, and use a unified object model. Still a long way to go in a short time. I’ll share progress as we make it to solicit feedback from the community.